When Mirvish announced they were bringing Billy Elliot to Toronto I was very excited. My excitement level, my expectations of enjoyment, they didn’t even come close to half of how much I *actually* enjoyed it. This was, without a doubt, the best big musical production I have ever seen in my life. It is pretty high up on my list of best performances ever. Billy Elliot The Musical was phenomenal. You really really should go and see it. There are four actors who play Billy Elliot on a rotating basis. The night I saw the performance it was Cesar Corrales and he blew me away. He is an incredible dancer. The temptation is to add in qualifiers about age when a dancer is young “he’s great for his age” kind of thing, but with Corrales, there are no qualifiers. He is fantastic. He would be fantastic performing at this same level as a 25 year old. He was a sight to behold. But the dancing prowess doesn’t stop with Billy, the cast is filled with fantastic dancers in a really wide range of ages. And, it’s not just the dancers that pull it off. The piece had some of the best choreography I have ever seen. I loved the juxtaposition of adults dancing alongside kids, but really dancing, the kids weren’t a cute token addition, they were a serious addition to the dance. 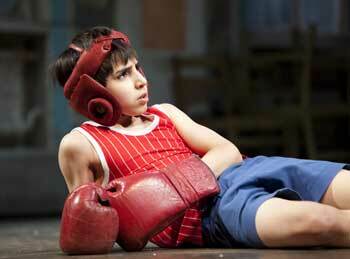 The show, based on the movie Billy Elliot, also has a pretty captivating plot. There were good performances by the actors on stage, these folks weren’t just skating by on their singing or dancing abilities. But if I were being honest, I’d say what really captivated me was the dancing. It was fantastic. In the first act I remember thinking “I wish they’d dance more”. My wish was granted, the second act was jam-packed with dancing. The piece is getting rave reviews across the board, so you don’t have to just take my word for it. Also, on the night I was there the audience leapt to its feet on several occasions, so it’s safe to say they loved it too. I’ve never actually seen a standing ovation at intermission before, it was pretty cool. What I’m saying here is beg borrow steal, whatever you have to do, to go see Billy Elliot the Musical. Honestly, it’s fantastic. I really can’t say enough good things about it. You’ll have to just see it for yourself to understand my dumbstruck reaction.